- 6 Hours (approx) of award winning immersive entertainment. - Basic survival knowledge required. - Warning this is the ultimate test of survival, you must be physically fit and healthy. - Set in a 5 acre Forest, with camps, towers, trenches, bridges, tanks and no safe zones!. - Maximum teams of 10, teams are not guaranteed to stay together. - Stag/Hen/Corporate groups are not permitted. With the bag on your back and basic supplies, you'll be faced with the challenge of true survival. If you do not organize quickly, create a base camp and begin preparations for the invasion only the sweet release of death awaits. The dead aren't the only problems you'll face. Finding food, water, ammo whilst battling rebel groups and building relations with fellow factions will put you, your camp and all your resilience to the test." We're back in the forest for our famous overnight zombie experience! Many of our fans have been asking for a true test of survival and here it is. 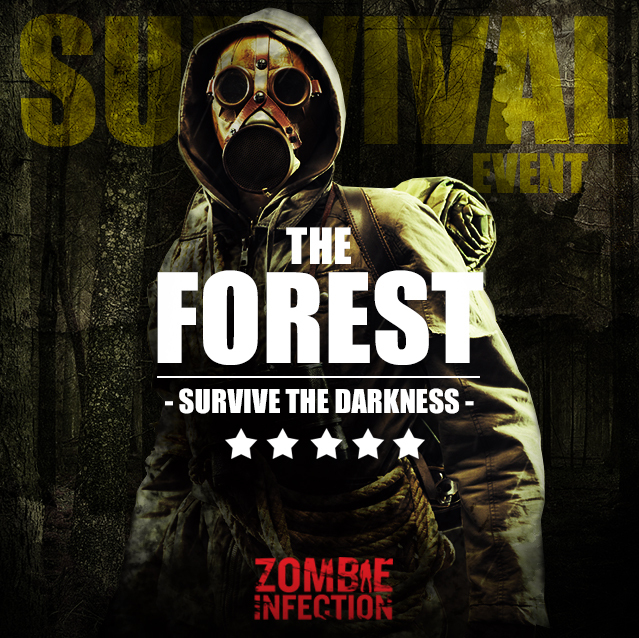 This event will have you questioning whether you really have what its takes to build a settlement, survive a night on basic rations all the time with the infected knocking at your door! On arrival you'll be drafted into factions and set off with just a map and a backpack to find your base camp. You'll then have to build defenses, gather supplies, negotiate with fellow factions and keep your camp alive as long as you can! Be warned, it will be cold, dark, fast and dangerous! Only the very brave apply. Please note this is 18+ only, late arrivals or guest arriving intoxicated may be refused entry. This is a physically intense event, you will be required to bring equipment. Stag/Hen/Corporate groups are not permitted and will be refused a refund at the management discretion.